We also manufacture Specialty Parts including Pedals and Levers for gearshifts, clutches, and brakes, Wheel and Steering Components for All-Terrain Vehicles, and Chain Anchors for forklifts, stackers, sideloaders, order pickers and reach trucks. In addition, Strong Forge & Fabrication is the only OEM supplier for the (Humvee) Military Lifting Shackle. 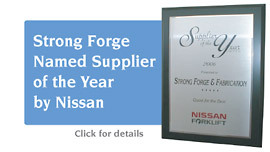 In addition to our extensive in-house capability, Strong Forge & Fabrication also provides StrongSource® global sourcing services to help ensure that you get the best quality and competitive price, with reliable delivery for both medium and large production orders. For large or small heavy-duty parts, look to Strong Forge & Fabrication to make a full-force commitment as your single-source supplier. We can quote and work from concept, drawings, or actual parts. Contact us for your next project. 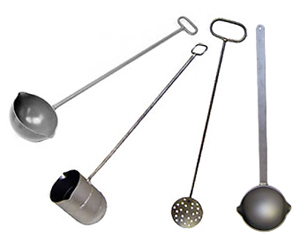 Strong Forge & Fabrication is affiliated with Batavia Engineering, manufacturer of a comprehensive selection of steel hand ladles and saucer-shaped skimmers for the metal casting industry. To visit the website of Batavia Engineering, click here.